Best training for fat loss? The best training for fat loss is the kind that makes you forget about your body hang-ups and enjoy what your body can do. What if instead of hating your thighs, you marvelled at how much they can squat, or how strongly they carry you up that hill? 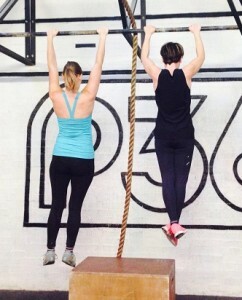 What if you stopped worrying about a wobbly belly, and got carried away by the joy of mastering a pull up? Imagine if you no longer took any notice of pictures of ripped abs on Instagram because you were too busy admiring people of all shapes and sizes lifting heavy weights on YouTube! This may sound unlikely, nay, impossible. If you’ve been unhappy with your body for twenty years or more, that unhappiness has almost become a part of who you are. But training to get stronger and fitter can change all that. I’ve seen people change forever within a few weeks when they realise that this body they have spent decades being ashamed of, is actually a pretty damn amazing piece of work! Lifting weights is particularly powerful (no pun intended) as it seems so alien, so difficult and so dangerous! But once you try it, you find that it’s exhilarating, empowering and fun. When you are training to improve your performance, you start to think of yourself as an athlete and this changes your relationship with your body. Now you care about being properly fuelled and recovered. Now you don’t want to indulge all the time as you feel sluggish in training. When you feel hungry, it’s more likely to be for something nourishing than something to help you feel better. Now you see some muscles developing and instead of being scared you are excited. 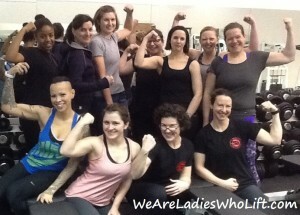 More strength! Without thinking about it much, you realise you’ve got a body that looks strong and athletic, at whatever size. You have a physical presence, you carry yourself differently. You walk around with confidence. You may even indulge in a bit of smugness from time to time about your training but it’s just because you’re proud. There is still enormous pressure from society to have a certain physique, and there is still a huge amount of social media ‘noise’ to block out. But now you have something to fight it with. Now you have an alternative paradigm. The answer is both complicated and also simple! It’s complicated because it’s an individual thing and you need to consider someone’s body, background and situation in the round. But it’s also quite simple. It’s often because people are trying too hard and stressing about it too much. Because they take on an unrealistic plan and end up disappointing themselves. Because they try to punish their bodies instead of nourish and care for their bodies. Let me tell you a secret about successful bodybuilders. They love what they do. That is why they can be successful. The impulse to start may have come from the pain of being unhappy, but they discovered that they enjoyed the process. Most people only think about the results, but results are fleeting. It’s the process that matters, since that is where you spend most of your time and energy. If you love what you do, how you train, how you eat, you will be successful in the end. What I care about is being strong, developing technical skills, enjoying nice food but not overdoing it. So that’s the life I lead and my body reflects that. Many people feel under pressure to transform their bodies into whatever the current fitness trend is. One year it’s visible abs, the next year it’s a big booty. As if it were a question of buying this season’s clothes, wearing them for three months and then discarding them and turning to the next thing. Your body is not to be treated like a discardable fashion item. It’s a cliche but it’s true: you only have one body. Care for it, nuture it, challenge it, be proud of it. I couldn’t agree more – perfect! Brilliant piece, Sally. I’ve dabbled in lifting but I suffer from agoraphobia and live in an area where there are no one who could train me to lift heavier than I am. I have a tiny house but I do have some weights and a bar and I absolutely LOVED lifting and getting stronger and as you say, instead of hating my body, I paid attention to diet and I walked more confidently and I KNEW I was on the right path and couldn’t wait to see my new body made by me! I’ll get back to lifting again for sure but I just wish there was a trainer near me.